You'll be £12.00 closer to your next £10.00 credit when you purchase A Century of Sea Travel. What's this? This book is a voyage through the life of the passenger steamship, a voyage described by travellers who sailed on these vessels, and it carries within it their thoughts and experiences, mirrored here in words and pictures. The pictures are memories of ships and places in times gone by, glimpses of steamship travel through the years. In memoirs and letters home, diaries and journals the writers recorded every aspect of their seagoing experiences: they wrote of their ship, its crew and their fellow passengers, of the food and entertainment on board, of romance, accidents and disasters, and of being dreadfully sick. They noted incidents on board that amused or angered them, described the ports at which their ship called, and the fear and excitement of storms at sea. The writers were emigrants or colonial rulers, men of letters, young men seeking their fortune, wives on their way to new homes abroad; some were rich, many were poor and escaping the hardship of downtrodden lives; all had in common the experience of voyaging at sea. The author has woven their words into a narrative that describes so evocatively a world that has now disappeared, and with the huge range of illustrations brings back to life the golden age of the steamship. Beautifully designed and printed, this book will delight armchair travellers, ship enthusiasts and all those who still go to sea to seek romance and adventure. An entertaining and informative glimpse into a bygone era. This book captures the flavour of this era by means of interesting facts, first person accounts of passengers and most important of all, over one hundred colourful illustrations. These illustrations add a lot to the book and to the enjoyment of the ambiance of these days of slower and more relaxed travel. The illustrations are a fascinating mixture of coloured postcards by well known marine artists from W L Wyllie to Charles Dixon, Kenneth Shoesmith and Odin Rosvenge, baggage labels, menus, posters, brochures, letters on steamship headed notepaper, and passengers’ black and white snapshots of life on board. As such it is certainly a book to pick up and put down, look at and enjoy at random but it is much, much more than that. Woven in between this kaleidoscope of colour is an introduction, thirteen very full chapters, a bibliography and index and end papers illustrating, again in colour, over 200 flags and funnels of the major British steamship lines from between the two world wars. The authors have collected together and cleverly worked into their narrative, the experiences of sea travellers gleaned from their letters home, diaries, postcards and journals which capture at first hand what it was like to travel by sea in this golden age. The result is a book that becomes compulsive reading from cover to cover, where the pictures actually become almost a distraction. As a traveller by sea both on traditional sailing craft and on contemporary cruise ships, I found this book a fascinating read, well written and researched, and I would unhesitatingly recommend it to all ship enthusiasts. In fact it should be essential reading for all cruise operators and their passengers alike. The authors call their book a kaleidoscope and that is a perfect description: A complex, colorful, and shifting pattern or scene. Given the source and intended purpose of the material, its charm lies in being just what it is—subjective observations with no ambition of offering any sort of exhaustive or even insightful treatment of a topic. This is a lovely book and, at first read, you’ll probably not be able to resist the temptation to keep turning pages. But, like any smorgasbord, it’s best to pace yourself and take time to “digest” the riches in quiet moments here and there. Christopher Deakes and Tom Stanley have produces a beautifully illustrated maritime history from the perspective of those individuals who actually experienced voyages tot he four corners of the globe from the beginning of the steamship era (ca. 1840). The commentaries of the passengers selected from a profusion of letters, diaries, and newspaper accounts make most interesting and revealing reading. The result is that not only are we given the passengers' individual perspectives on the ports-of-call, but on every aspect of the voyagers. Certainly one of the most interesting aspects of Deakes and Stanley's book is the beautiful colour illustrations from all over the world featuring the ships, their interiors, and highlights of the ports-of-call. These serve to enrich the commentaries and narratives of the passengers to a superb degree. A Century of Sea Travel, Personal Accounts form the Steamship Era will be a greatly appreciated addition to any maritime collection. When given to an impressionable young person, this sort of book might start a lifetime of interest in the subject. For older people it also has some lovely images of the heyday of the steamship. Contains a delightful collection of illustrations. Recommended as an entertaining book to delve into again and again. A real delight. Beautifully and lavishly illustrated, there are photographs. Anyone interested in ships will delight in this book – the wonderful images alone, make it a must, but complemented by the excellent narrative it will be a welcome addition to any ship lover's library. Highly recommended. A delightful insight into an era when travel, even for pleasure, was still much more of an adventure than it is today. A Century of Sea Travel is a spell-binding journey through the century long history of the passenger steamship, and provides an evocative picture of the ships, the crews, the food and entertainment. Amusing anecdotes and notable incidents, glimpses of romantic interludes, accidents, disasters, and storms bring the heyday of steamship travel vividly to life. United by the common experience of voyaging at sea are the memories of such diverse and interesting characters as emigrants, soldiers, fortune-seekers, administrators, the rich, and the poor. This book is informative as well as highly entertaining. This book is a spellbinding journey through the century-long history of the passenger steamship. Amusing anecdotes and notables incidents, glimpses of romantic interludes, accidents, disasters and storms all bring the heyday of steamship travel vividly to life. The book is informative as well as highly entertaining. Making extensive use of first-person accounts and marvelous imagery, this book does a grand job in capturing the era when sea travel was seen as romantic and exotic - whilst simultaneously conveying the reality of life onboard. 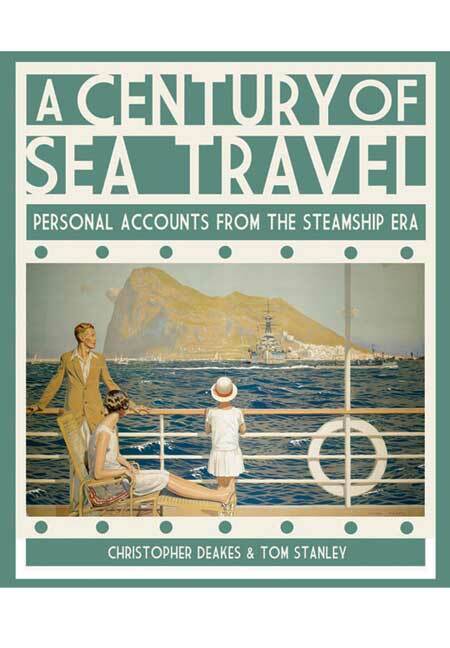 The authors have done well in weaving all the accounts into a coherent and entertaining whole, which captures the many different aspects of travelling by sea in the early 20th century. Their work is aided immensely by the terrific illustrations which are used well and in frequently fascinating juxtaposition to the text. Super - beautifully produced and fascinating to read. A real captive of the period. A Century of the Sea Travel......fantastic, absolut great!!! The passenger steamship was the most excitement development of its age and in this colourful hardback Christopher Deakes & Tom Stanley pay homage to it and its many passengers, making this a gloriously nostalgic read for steamship enthusiasts everywhere. What should be noted is that this is not a book which focuses specifically on the ships themselves (their construction, design etc) rather an evocative look back, using first-hand accounts as indicated in the title, at the many and varied seafaring experiences that people enjoyed (or sometimes didn't) over the years. We are therefore offered a rich tapestry of interest to include many accounts of life on board, from the food, entertainment, romance, gossip, disaster, not to mention being dreadfully sick. These experiences are garnered from all aspects of society at the time; emigrants sailing in the hope of a better life, soldiers en route to distant outposts, or just the wealthy sailing the sea for leisure. The result is what the authors refer to as a 'kaleidoscope' of memories, neatly pieced together along with plenty of nostalgic illustrations to splash even more colour onto text packed with fascinating global stories of its time. In my opinion this is a beautifully reminiscent collection which covers all aspects of steamship life in a very social context and is bound to interest everyone, not just those of an engineering persuasion. Christopher Deakes worked for many years as a shipping agent in the Far East and in different parts of Africa. He has been an avid collector of shipping postcards and his first book, The Postcard History of the Passenger Liner, was published to great acclaim. TOM STANLEY, once an architect, is one of the leading collectors and dealers of shipping postcards and ephemera.